I’ll give you the slice on Psycho Suzi’s Motor Lounge. Located in Northeast Minneapolis, a visit to this place will have you feeling like you are on a tropical vacation even in the dead of winter. Inside, you’ll find the walls adorned with over 50 tiki figurines of every shape and size. The inspiration for this winter oasis came from owner Leslie Bock’s love of 1920’s style tiki bars and the biker culture. Psycho Suzi’s is known for serving up a wide variety of fried foods and their unique pizzas, which are made fresh to order. Guy Fieri of the Food Network’s “Diners, Drive-ins and Dives” stopped in when he visited Minneapolis. See what he thought in the link below from his show. A group of friends and I decided to head to Psycho Suzi’s to celebrate my friend Blake’s birthday. Minus Blake, all of us have been here before and we couldn’t wait to be back, especially since it’s been so nice in Minneapolis lately. Since the weather has been so nice, we’re able to sit on their outdoors patio, perfect for summer. Deciding to try our luck for Blake, we asked our waitress if there were any specials for a customer celebrating their birthday. To Blake’s benefit, there is definitely a perk to celebrating your birthday at Psycho Suzi’s. 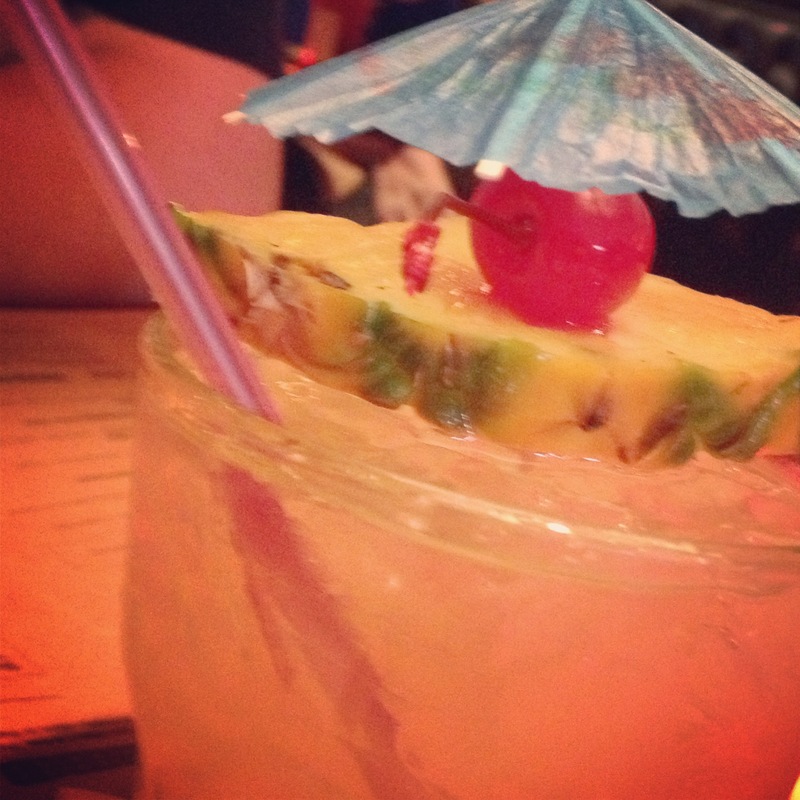 You are given a free cocktail that will bring your thoughts to a tropical paradise upon first sip. After he allowed us to try some (it looked so good we couldn’t help but ask) we determined that it was mixed with rum, pineapple juice and some sort of coconut beverage. It was pretty impressive and definitely fit the tiki theme. After we got over the excitement of Blake’s birthday cocktail, we had to order something warm and deep fried. Funny enough, almost everyone at the table ordered up a side of tater tots. 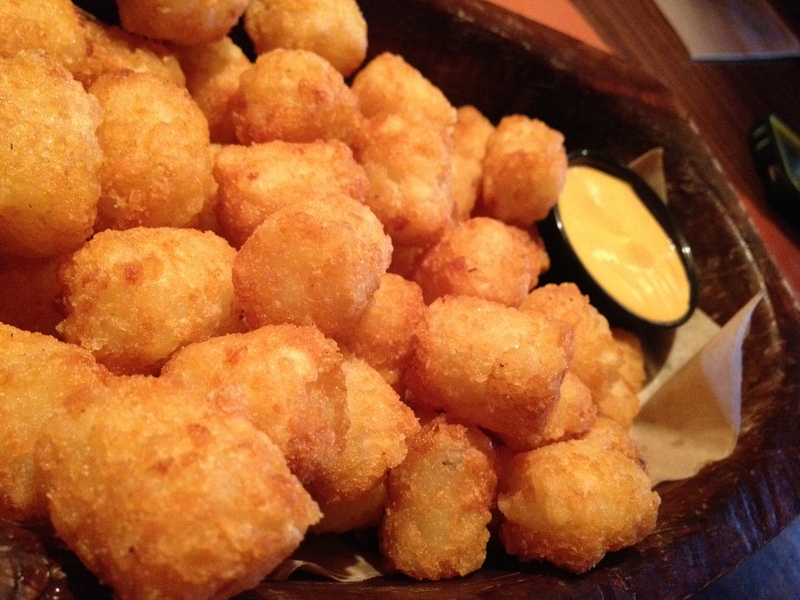 “Hey Napolean, can I have some of your tots?” – Napolean Dynamite, 2004. I don’t know about you, but that one-liner pops into my thoughts every time I hear or see tater tots! Now, hear me out. Not only are they served to you piping hot, but they come with a dipping sauce that really makes ordering them worth it. The sauce tastes a little like a mixture between horseradish, mustard and another tangy, yet flavorful condiment. All I can say is that the tots didn’t last long, thank you delicious sauce of awesomeness. The last couple times that I’ve been to Psycho Suzi’s, I didn’t end up ordering their pizzas. This is probably blasphemy to anyone who has had a slice of Suzi’s pizzas. The past couple times I’ve been here, I really just wanted a burger. Trust me, those taste great here too and are more unique than your typical patty, cheese, lettuce and tomato on a bun. On this visit, however, my fiance and I decided it was time and we ordered a large of their “Fastback” pizza. What’s the Fastback? 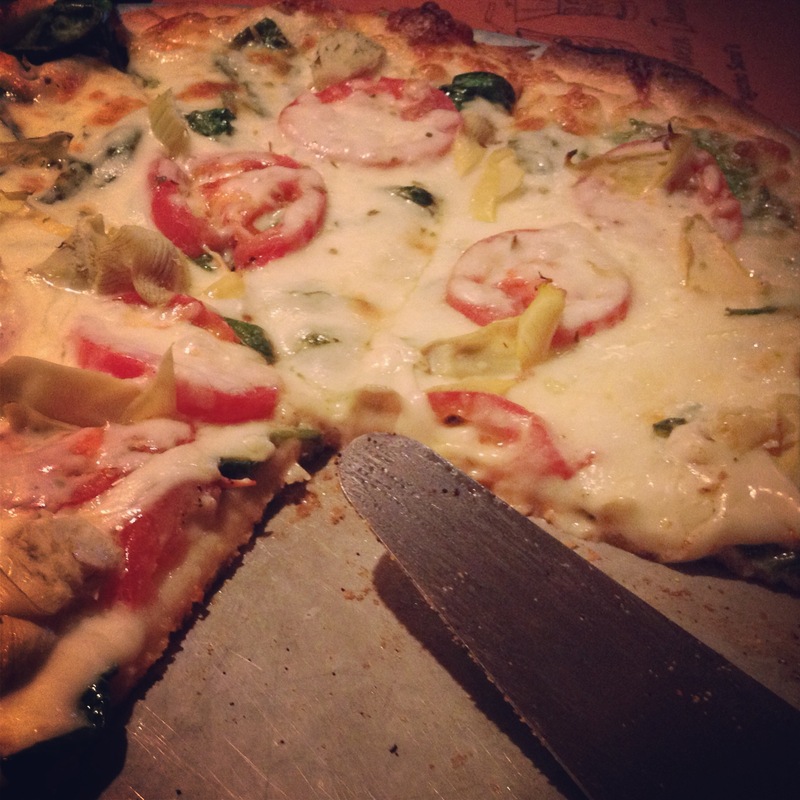 It’s a thin crust pizza topped with artichokes, fresh spinach, tomato and Suzi’s signature white-wine garlic sauce. If that didn’t make your mouth water, there is just no hope for you. This was pretty much one of the best pizzas I’ve ever taken a bite out of. Not only was it cooked enough so that the cheese was stringy when pulled apart, but there was no hint of a burnt crust in any slice. Two thumbs way, way up for the person who made our pizza. You did a fabulous job and I will definitely be stopping in soon to try a deep dish pizza. I’d highly recommend a trip to Psycho Suzi’s Motor Lounge. This is simply a restaurant you must visit at least once if you are visiting the Twin Cities. Not only do they serve up unique versions of our favorite comfort food, but you won’t find an atmosphere quite like this. The wait staff are super friendly and are more than willing to joke around with you. Additionally, it’s a nice, casual hangout for anyone wanting to spend some time with buddies or someone needing a place to take their family. Rest assured, Psycho Suzi’s is the place to be.